On the 22nd of January 1865 there was a Christian assembly in which I notified those gathered of my intention to retire from the office of pastor in order to retreat to peaceful existence. For the sake of forbearance and tranquility I do not wish to give my reasons. It was Hochstetter's unbearable babble from the pulpit, his dark and false teachings. I had already warned him about them three or four times, but things got worse instead of better. The congregation did not abandon me. I had to continue in my ministry with sorrow and soulful angst until the year 1866. — January 25th and February 6th. "It was long before January 25, 1866 — there were notes written (by me), which would have been used in my petition (case) to the Church Ministry. The reasons for my petition (accusation against Pastor Grabau) to the ministry come from the fact (so he says) that my confessor, Pastor von Rohr, totally convinced me of the following: it would be an injustice, or at least a cowardly act, if I quietly withdrew from the Synod without registering protest. Much more, it was my duty to begin a public battle in opposition to the prevalent misuse of power (by Pastor Grabau)! "Pastor von Rohr repeated this advice against me in the first week of the year (1866) in the following correspondence I had with him." That Deacon Hochstetter believed he had seen me misuse power (after he had been warned by me often about his sermons). Neither he nor Rohr had sent me proper communiqués about this misuse of power. That Hochstetter wished to quietly withdraw from the Synod but he was moved and compelled by Rohr to begin a public battle against me. It is thoroughly clear that Rohr played with Hochstetter in the name of confessor and incited him to take on the role of agitator and mutineer against me. We have never before heard of a confessor who incited open battle against a ministerial colleague when he should have been a brother mediating towards peace. While Rohr, in the role of confessor, was inciting Hochstetter to rebellion against me in 1865 and 1866, he suggested to me that I remain silent about Hochstetter's sermons in the hope that Hochstetter's preaching would improve. And I remained silent. The time of Rohr's instigation ('65 and '66) was the same as the period in which he thought I had insulted him about his son's appointment to Winona; but he said nothing to me. It was also the time in which he believed that, among other things, I had insulted his daughter in a warning I had issued. The Deacon Chr. 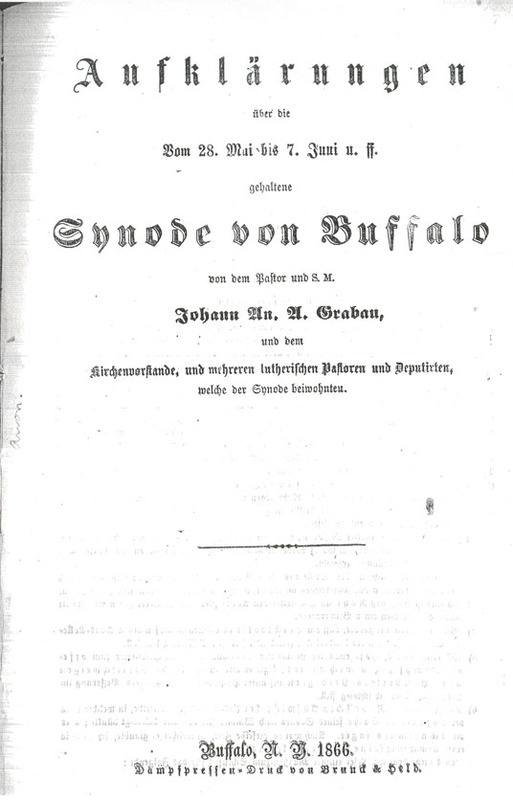 Hochstetter (at the time appointed to the German-Lutheran Trinity Church of Buffalo) had accused the pastor of the congregation, J. 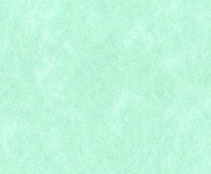 An. 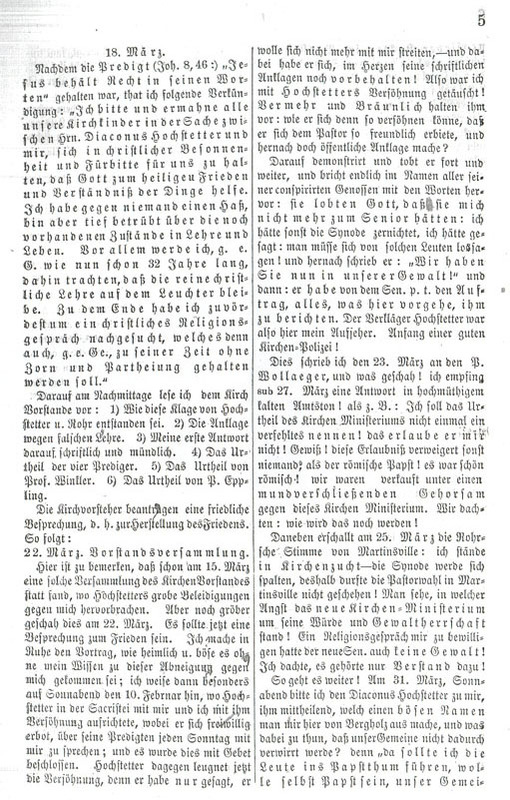 A. Grabau of false doctrine in February 1866 because of the sermon he delivered on the feast of St. Paul's conversion (January 25th). "He may have brought forth doctrine not based on the Word of God; he considered it proper preaching based on pure doctrine taking the place of Holy Scripture and when someone preaches strongly and clearly it need not be proven; thus he may be damned according to Galatians 1: 8,9." I (Pastor Grabau) defended myself against this accusation on February 28th because it was not true. On March 8th the Church Ministry, made up of 4 or 5 pastors, issued a verdict on the doctrine which I could not accept since it was unjust and contained false doctrine within it; I was called to a full session of the Church Ministry of the Synod on March 23rd. "I may have committed heresy," and much more. This compelled me to assemble my Christian community on April 8th, the Sunday after Easter, in order to clear and reestablish my good name from the accusation of false doctrine. I was censured and called before the Synod with the congregation and the church committee because of doctrine at a meeting held June 4th. Hostile Deacon Hochstetter did not remain quiet during all this because I had disputed his rantings on the pulpit at the April 8th assembly. For some time Henning's sect or gang existed among the congregation but they had not yet come out in the open; Hochstetter along with Grollmitz and Trustee Becker secretly joined this sect. With these men he made plans behind my back and without consulting me he sent a letter to the chairmen of the Church Ministry, P. Wolläger, in order to request an extra session to investigate me. This investigation would have taken place on April 19th. However, just as I had done with the church committee, I did not answer the summons for this investigation since we had already been called before the Synod. *) Thus the Church Ministry proceeded ever more vehemently; it was spiritually and physically in league with the Hochstetter - Henning contingent against the pastor, church committee and trustees! My accusers (Rohr and Hochstetter) were part of this Church Ministery, joined by their fellow conspirators, among them B. Brand, Weinbach, Zeumer. suspended me quite pleasantly and comfortably from my post on April 21st. Since I did not accept the suspension from office at the Synod, while the appeal against me and the congregation was being considered by the Synod, the Ministry believed it was justified in holding annex or rebel church services at the M.L. College on Maple Street! Hochstetter became the annex or rebel preacher by choice of this ministerial assembly! 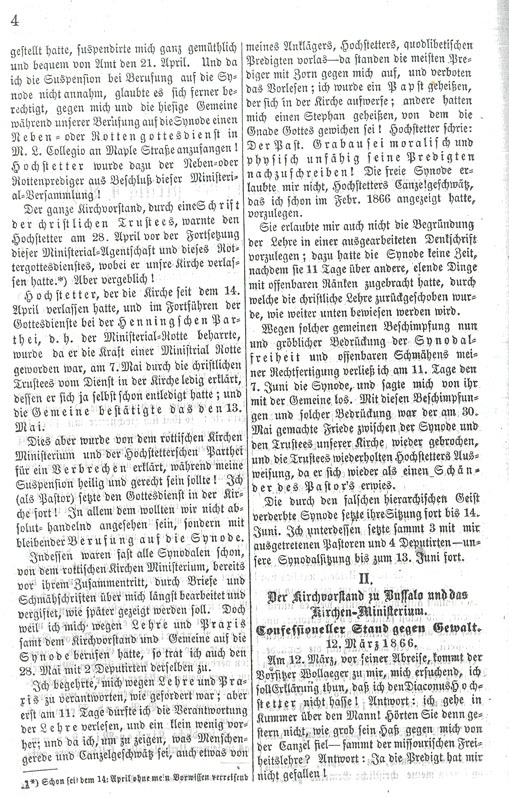 Through a communiqué the entire Church Committee advised Hochstetter on April 28th against the continuation of ministerial practice and this rebel church service, whereby he had abandoned our church. *) However this was in vain! 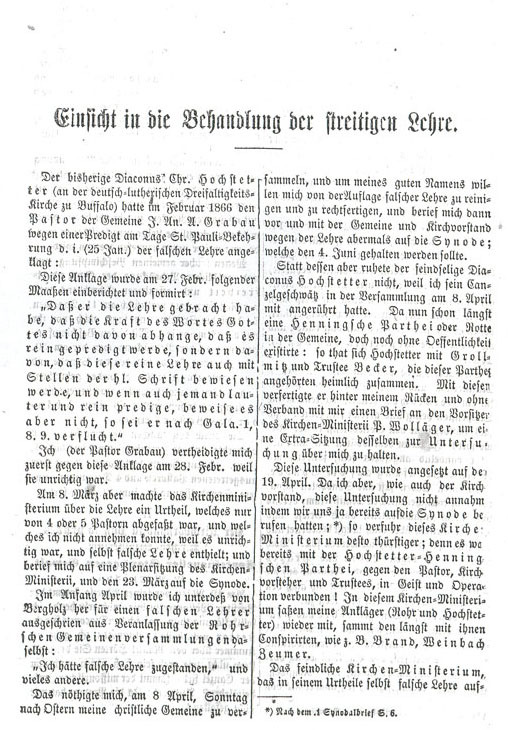 Hochstetter, who had abandoned the church since April 14th, continued the church services with the Henning sect, i.e. the Ministerial gang. He became the driving force for the Ministerial gang. On May 7th he declared himself free from service to the church through the Christian trustees, whom he had himself dismissed; and the congregation approved this on the 13th of May. This was declared a transgression on the part of the gang church ministry and the Hochstetter contingent while my suspension was supposedly holy and just! I (as pastor) continued to hold church services. Above all else we would not see the matter settled except through a summons to the Synod. By the time of the assembly however, almost all the synods were already worked up and poisoned against me by letters and libelous notes from the gang church ministry and these will later be shown. Thus called before the assembled church committee and congregation because of my teachings and practices, I arrived on May 28th with 2 deputies. I wished to answer the charges brought against me concerning doctrine and practice; on the 11th day I had the response prepared, even a little bit before; I wished to show what people had been saying about me, what rantings had been presented from the pulpit by my accuser, Hochstetter, in his so-called sermons - most of the preachers approached me with scorn and forebade the reading of my response; I was called a Papist, who had caused revolt in the church; others called me a Stephanist from whom the Grace of God had been withdrawn. Hochstetter cried: Pastor Grabau may be morally and physically incapable of writing his own sermons. 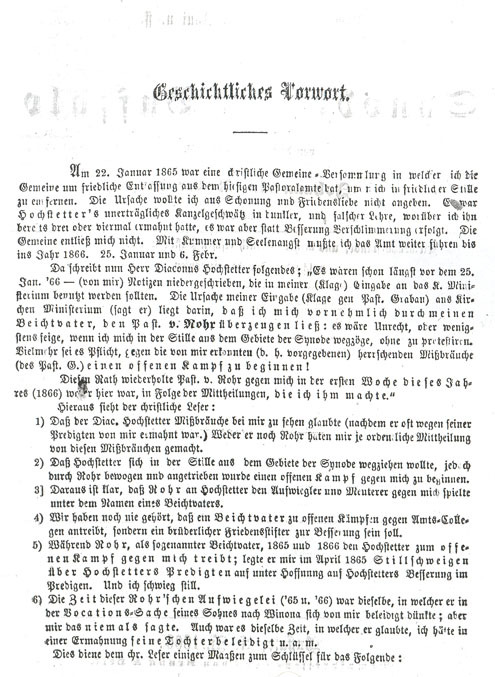 The Free Synod did not allow me to bring forth Hochstetter's rantings from the pulpit, which I had already presented in February 1866. They did not allow me to present the basis for my teachings in a prepared statement; they had no time after 11 days of deliberation over other miserable things having to do with exposed intrigues by which the Christian reader would be repulsed, as will be shown below. I resigned from the Synod on that 11th day, the 7th of June, because of the common abuse and the gross oppression of Synodal freedom and the public slandering of my reputation. I departed from them with the congregation. The peace between the Synod and the Trustees of our Church was again broken amid this abuse and oppression on the 30th of May and the Trustees revoked Hochstetter's credentials since he had proven himself a slanderer of the pastor. Perverted through a false hierarchical spirit, the Synod continued its session until the 14th of June. I in turn assembled with the 3 pastors and 4 deputies, who had withdrawn with me - we convened our Synodal session until June 13th. On March 12th, before my departure, Chairman Wollaeger came to me and suggested I provide a statement to the effect that I did not hate Deacon Hochstetter! My answer: I'm deeply troubled by the man! Didn't you hear it yesterday how great his hate is for me in his words from the pulpit? Has the Missouri Free Thinker come? Answer: Yes, I didn't care much for the sermon! In accordance with the Gospel of John, 8:46 "Jesus was righteous in His Words", I prepared the following announcement: I ask and admonish all the children of our Church in the matter between Deacon Hochstetter and me to contemplate in Christian prudence and prayer that God may assist in the matter with holy peace and understanding. I have hatred for no one but I am deeply troubled over the current matters concerning doctrine and life. Above all else I will endeavor, as I have for 32 years as a churchman, to illuminate pure Christian doctrine. To this end I have sought to my utmost a Christian dialog in which the other churchman should take part without scorn or sectarianism." In the afternoon I stated before the Church Council: 1) How this accusation by Hochstetter and Rohr came about. 2) The accusation of false teachings. 3) My primary response given orally and in writing. 4) The verdict of the four ministers. 5) The verdict of Prof. Winkler. 6) The verdict of Pastor Eppling. One will notice here that already by March 15th the Church committee was in session, at which Hochstetter had raised his gross complaints about me. However even worst things happened on March 22nd. It was supposed to be a peaceful discussion. I quietly delivered a discourse on how secretly and insipidly this state of things had come about without my knowledge; I found out on Saturday evening, February 10th when Hochstetter was in the sacristy with me and I offered to reconcile with him, whereby he offered to freely discuss his sermons of each Sunday with me; the matter was closed with a prayer. Hochstetter now breaks the reconciliation in which he said he no longer wished to dispute me - and yet he carries the dispute on in his written accusation! I was deceived by Hochstetter's bid for reconciliation! Vermehr and Bräunlich reproached him: how could he seek reconciliation if he offered the pastor friendship and yet made public accusations? At this he demonstrated and carried on and eventually came forth with these words in the name of his fellow conspirators: they praised God that they no longer had me as their Senior Minister. I had already broken my ties with the Synod; I had said, "One must distance himself from such people!" to which he wrote, "We have you in our power!" And then he commissioned the Senior Minister pro temps to report everything that had happened here. The accuser Hochstetter was now my supervisor. The beginnings of a fine Church Police State! On March 23rd I wrote Pastor Wollaeger and what happened! I received a reply in a most arrogant and cold official tone dated March 27th. For example: I shall not declare the verdict of the Church Ministry an erroneous one! He would not grant this to me! No one besides the pope in Rome denies permission! It was so Roman! We had been sold under an orally binding clause of obedience to the Church Ministry. We thought: How could this be! Next Rohr's voice sounded from Martinsville on March 25th: I'm stranded in ecclesiatic discipline - the Synod will split, thus the choice of pastor for Martinsville will not happen. One can see the anxiety the new Church Ministry had over its validity and leadership! The new Senior Minister has no power to sanction a religious discussion with me! I thought it stood to reason! Photocopy of the text provided by the Yale Divinity Library, New Haven, Ct.